The chart above illustrates Series A pre-money valuations in red. The grey line smooths the chart to show long term changes and the blue dashed line marks the 2004 Median Series B pre-money. 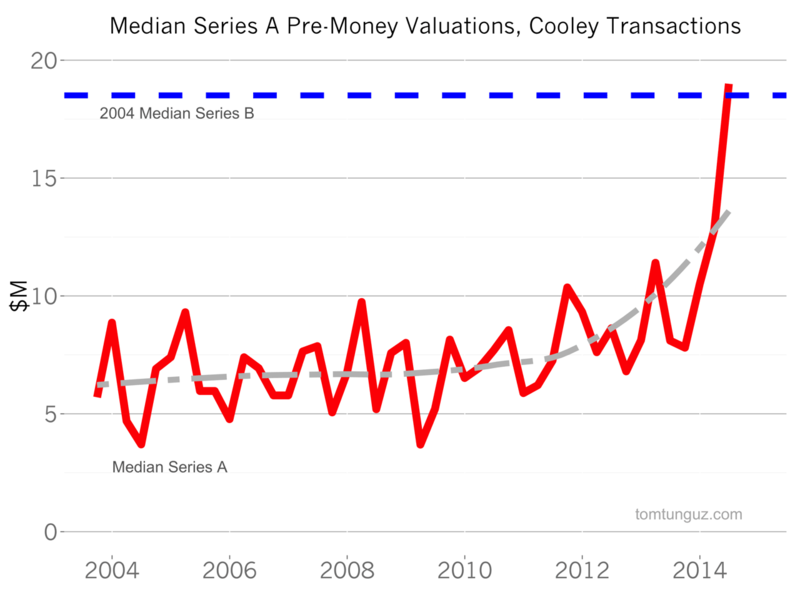 In Q2 2014, the median Series A transaction reported by Cooley exceeded the 10 year Series B valuation. In fact, Series A prices have simply taken off, nearly doubling in six months. This is the same chart for Series B valuations. 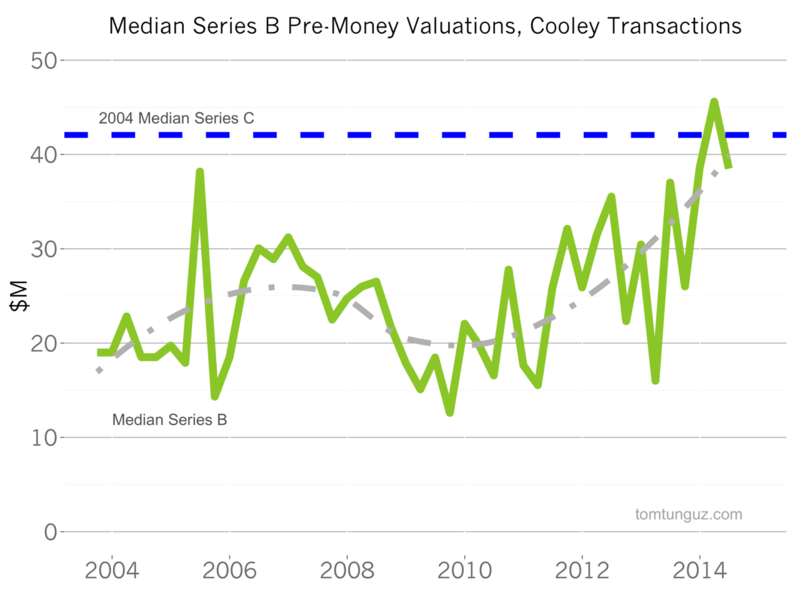 Pre-money valuations have increased in Series Bs as well, although to a lesser degree than Series As. Series B valuations have also exceeded their ten year Series C prices, but the rise has been more gradual than in Series As. The Series A valuation explosion is probably fueled by the tripling of capital in the institutional seed market. As young startups raise larger seed rounds, they are able to progress further, develop more momentum and increase their valuations before raising the next round of capital, the Series A. As for the question, why now? It may be that the first wave of big-seed-round-startups, who raised in 2012 and 2013 are maturing 12 to 18 months later. This valuation increase hasn’t manifested itself in Crunchbase data, yet. There are a few possible reasons for this. First, Cooley’s data focuses on a tiny sliver of startups and this sample may have a very strong skew to the most valuable companies. Second, Crunchbase reports the round size, but not valuations. Perhaps investment size is remaining constant but valuations have increased and investors are satisfied with less ownership. Third, Crunchbase data may be delayed because some of the Cooley transactions haven’t been announced yet. Nevertheless, I’ll be paying attention to the Series A market, because if the trend continues, and the Series A replaces the B, we can finally state with confidence that the Series Seed is new Series A, which would imply a very substantial change in industry dynamics. Institutional seed funds will have become the new de-facto Series A investor. NB: If you’re a founder, I recommend reading Cooley’s report which reveals the standard terms found in today’s term sheets. This data should help you understand what to negotiate for when raising capital.